Cory Smythe tells stories. About stories. 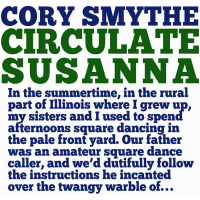 Specifically, a father's tales in the rural heartland of America; ingredients that a listener might assume had shaped Smythe's imagination in ways that go far beyond music. But like the Stephen Foster discs spinning on the gramophone as a tornado approaches, Smythe's nostalgic and inspirational world is liner-note fantasy. Nevertheless, on Circulate Susanna those flights of fancy have manifested themselves in a near-indescribable collection of compositions and improvisations. There are hints of western swing, bits of psychedelia, microtonal scales, and what Smythe describes as "an alien Alan Lomax field recording." Smythe is a superb pianist and eclectic composer. His jazz resume includes recordings with Anthony Braxton, Vijay Iyer and Tyshawn Sorey, and he has performed to outstanding reviews with classical violinist Hilary Hahn at the Kennedy Center. Smythe won a Grammy in 2015 for Best Chamber Music / Small Ensemble Performance. In 2016 he performed with Craig Taborn and Peter Evans as part of the Lincoln Center Mostly Mozart series. Smythe has recorded two excellent solo albums, Pluripotent (2011) and A U T O TROPHS (2017)both on Not Art Records. Guitarist Daniel Lippel frequently performs in solo and chamber music settings and has been the resident guitarist for the International Contemporary Ensemble for twelve years. He has performed as a guest of the St. Paul Chamber Orchestra, Either/Or Ensemble, New York City Opera, and many other groups. Lippel has worked with a number of prominent composers including John Zorn. Ethiopian born experimental singer and composer Sofia Jernberg is a Swedish resident with a similarly broad background. Jernberg is the co-leader of the chamber jazz group Paavo; the group received the "jazz group of the year" award from Swedish Radio. She has appeared on two recordings from the Mats Gustafsson led Fire! Orchestra and recently collaborated on a project that included Ken Vandermark. "Susanna soil ﬂutter" certainly aligns with Smythe's Lomax analogy but those interplanetary chirps reside in an overall setting that is dark and ominous. "Circulate to mole" centers on Jernberg's incredible vocal instrument, here a kind of staccato keening; on "Ladies load the telegraph," spoken word, and electronically altered on "Weave the ring" and the title track. Often the line is blurred between acoustic manipulation and stand-alone electronics as on "(Bullgine / lectric ﬂuid magniﬁed)" and "(Double star thru magniﬁed)." Throughout the collection, Smythe's piano and Lippel's de-tuned guitar seem to reference every skill in their considerable repertoire, in particular, on "Ladies horserun" and "Reverse soil flutter," where the music descends into a ferocious maelstrom. Circulate Susanna closes eerily and poignantly with "To gather the wind," a variation of "Strange Fruit." Alongside Jernberg's mesmerizing, unaltered vocal, Smythe has replaced sections of Abel Meeropol's troubling lyrics with improvisations rendered through a dense mix of piano reverberation, bowed guitar and whistles. Circulate Susanna is a theme as much as a title. "Oh! Susanna" like other folksy American classics of the mid-1800s such as "Camptown Races" and "My Old Kentucky Home" were widely popular (and are still sung by school children) but blatantly racist. It is an issue that Smythe tackles in a kaleidoscope of avant-garde influences, pointillist, and dense textures and controlled chaos. For those who crave intelligent experimenting, it is an album worth repeated listening. Track Listing: Susanna soil ﬂutter; Circulate to mole; Ladies load the telegraph; Weave the ring; Circulate Susanna; (Bullgine / lectric ﬂuid magniﬁed); Heads gather the stars; Ladies horserun; Twirl the bell, bullgine; Heads circulate to mole; (Double star thru magniﬁed); Reverse soil flutter; To gather the wind. Personnel: Soﬁa Jernberg: voice; Daniel Lippel: detuned acoustic guitar, electronics; Cory Smythe: piano, autoharp, electronics.